That was really close to being a damn good episode of Arrow, probably one of the best of the season. Sure, there are some issues you could reasonably take with some of the plotting—the whole business with Lance and Donna just about makes sense, but there’s a wonky familiarity to it that feels like we’re entering a story more than halfway through—but overall, “Monument Point” is a testament to how much the show benefits when Team Arrow truly, properly has its hands full. With no time left to brood, Oliver remains focused solely on the mission at hand, which makes his occasional deviations to counsel Diggle and Felicity’s Jonathan Pryce-looking dad all the more meaningful. Felicity too is cut loose here, and as much as the whole Palmer Tech storyline ran its course a half-dozen episodes back, I’m not going to quibble too much with a plot that pushes her attention away from Oliver and onto alternately saving the world and dealing with her untrustworthy father. “Monument Point” is a classic Arrow endgame episode with a heist thrown in for good measure, and Thea gets her own solid little subplot with Malcolm, Anarky, and her brainwashed hunk of a cutthroat political operative. This is all good stuff! But, dammit, one bizarre creative decision renders this all essentially weightless. So, right, let’s talk about the nuke. I want to be as clear as possible about my issue here. If Arrow wants to have a nuclear missile blow up a small Mid-Atlantic town and kill tens of thousands of people, then that’s fine. (Well, as long as it happens in-universe. It wouldn’t be cool if that were, like, a publicity stunt.) But we live in a world, and I have no reason to think Arrow is any different, where nuclear weapons have been used exactly twice in 1945 and then never again, and the bombs that were dropped on Hiroshima and Nagasaki were considerably less advanced than those in the silos today. The circumstances of this episode, with it strongly implied the worlds’ governments understand the launch codes have been hijacked, make it plausible that one nuclear missile wouldn’t cause widespread global Armageddon, but still… a nuke actually destroying any populated area in 2016 would be the biggest thing ever. It would fundamentally change the world by shattering the reassuring hope that the destruction of August 1945 will not be repeated. I don’t really see any reason that this would work any differently in the Arrow universe. All of which is to say, fine, go ahead Arrow, nuke a town. But if you’re going to do that, then spend some time with it. Sit with it. As terrifying as a powered-up Damien Dahrk might be, that reveal could be left for another episode, or at least placed on equal footing with Havenrock’s destruction. I’m guessing there’s going to be a contingent of viewers who are going to criticize how the show makes the nuclear blast all about Felicity, because this is a season where far too many things have revolved around some combination of Oliver and Felicity. Honestly, I don’t have as much of a problem with that, because it’s just good storytelling to center the latest tragedy on the main characters. But that doesn’t let Arrow off the hook for zipping past the town’s destruction, with neither Diggle nor Oliver showing any indication they’re aware of what just happened. Just to be clear, I don’t have an issue with any of this out of some moral concern. Arrow doesn’t show nuclear devastation the proper respect, but we can talk about that in strictly narrative terms. This is an episode marked by quick, shocking developments, ranging from Felicity’s firing to Alex’s death. Havenrock’s destruction is several orders of magnitude greater than what happens to Alex, but it isn’t given that weight in the story, and that makes everything else that happens feel less significant. Arrow is a fragile storytelling ecosystem, one that tries to balance superhero theatrics with soap opera romance, plus an increasing amount of preposterous magical and supernatural stuff, with just a hint of science fiction. An episode that engages in all those different elements, as “Monument Point” definitely does, is going to have one hell of a juggling act on its hands. And, for most of the episode’s running time, everything is finely balanced. Take Felicity’s relationship with her father. The episode provides little moments for both Felicity and Donna to voice their distrust of the man who betrayed them, but “Monument Point” makes it clear that business is very much on the bottom of the list of narrative priorities. Not that all the characters know that—indeed, some of the episode’s funniest moments some with the Calculator’s insistence that he explain himself in the middle of a heist. Felicity even has a moment later where she says the stakes are too high for her to come up with a standard one-liner response. “Monument Point” is a big, crazy episode—how could an episode with that Thea storyline thrown in not be?—yet it’s meticulously constructed and smartly paced right up to the moment Havenrock’s destruction just kind of overwhelms everything and throws it all off-balance. Maybe it sounds like I’m obsessing over this. It’s possible! 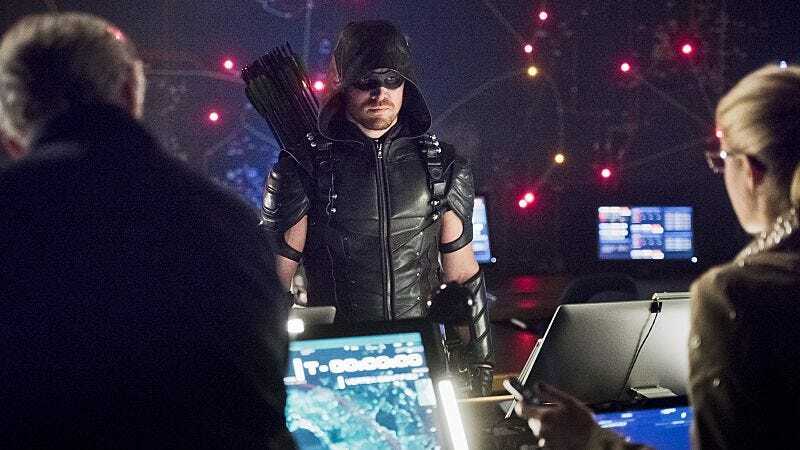 This is just new territory for an Arrow episode, as I’m not sure I’ve yet come across an episode this generally excellent that’s undercut so severely by a decision that, if not outright bad, is at least plenty strange in its handling. I don’t imagine Havenrock will be soon forgotten—this is likely going to shape Felicity’s character arc for a good long while—but this is, in an absolute sense, the biggest, worst thing that’s ever happened in the present-day Arrow universe, so it’s just odd for it be this rushed. We’ve reached a point, after a misfiring third season and an improved but still meandering fourth, where Arrow is going to have a fragile relationship with its audience for the foreseeable future, where any big creative decision is appraised not just in terms of “How well does it work?” but also “Does the creative team actually know what they’re doing here?” That’s an awfully meta way to be thinking about a show, but it’s hard not to reach that point after Arrow’s frequent narrative cul-de-sacs and ineffectual storytelling choices. The good news is that most of “Monument Point” represents Arrow at its best, and maybe a misjudged, bonkers swing for the fences like nuking Havenrock—or, more precisely, treating the nuking of Havenrock like it’s just another plot beat—is the price we pay for an Arrow that is otherwise confident in its storytelling and refreshingly light on angst. Hell, Oliver doesn’t blame himself for anything even once! This episode often recalls the best parts of the first two seasons’ endgames, as the stakes got bigger and the action got bolder. Maybe one thing tonight was a little too big and a little too bold. But far too much caution and repetitiveness in the show’s storytelling, I think I can deal with that. So, I’m generally not a big fan of a question people always raise with superhero universes, which is, “If that other superhero exists, why aren’t they always called in to help with the threat?” More superhero movies and shows actually address this by isolating their protagonists than is generally given credit for, but I think the all-purpose answer is, “Eh, they’ve all got threats of their own to deal with.” So I’m not bothered that Oliver doesn’t call on Barry’s help in most episodes. But I do think any global-level threat does kind of require some explanation as to why this isn’t a team-up scenario. I’m just going to assume this is set when Barry doesn’t have his powers. I generally find endearing the DC Universe’s use of generic fake city names, but Monument Point doesn’t work as well onscreen as it might do on the page. It just doesn’t really sound like the name of a city. Now, Monument City? That I’d immediately grasp is a city. Oh, hey flashbacks. Yeah, you’re still happening, huh? I guess we’re finally going to get some payoff for the constantly foreshadowed bit of business about Oliver’s sole friend in the camp getting turned evil by the idol. Cool. Thea’s subplot tonight only confirms my longstanding contention that Willa Holland is the best and more than capable of being the new protagonist. So, just as a crazy hypothetical: Let’s say we split Oliver and Thea and give them both a show of their own. 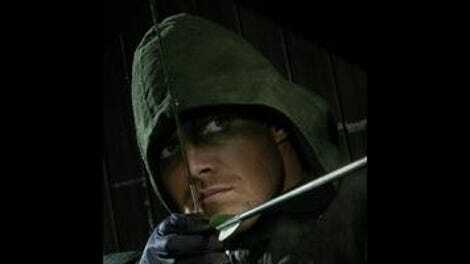 Do you spin Thea off, give her Arrow and do something new with Oliver, who I’d argue could benefit from a change of scenery? Perhaps you even put one of them on the next season of Legends Of Tomorrow, which could certainly benefit from one of them. I kind of like sending Oliver off to Legends for at least a half-season and radically restructuring Arrow around Thea for a bit. But then I’m a bit of a madman. The CW is advertising that Ninja Turtles sequel pretty heavily. I’ve got to say: I can’t imagine a more precise translation of Stephen Amell from TV to movies than having him go play Casey Jones. They might as well just drop the pretense halfway through and have everyone start calling him Oliver.